SohKiDo® is a Japanese hybrid word created by Dr. Sky that essentially means “The way of transpersonal creativity.” There are seven pathways of SohKiDo and, for the purposes of this five – book series, Dr. Sky conceptually focuses on SohKiDo as it applies to the world of the arts. This, the first of the SohKiDo books, is a comprehensive journey; it is specifically about creative writing as it projects one’s life. SohKiDo reveals writing as a means to express and heal, to grow and probe the depths of spiritual mysteries. It is a multi-faceted book offering insights into energy, creativity and spirituality. A theoretical framework and practical tool is introduced to identify whether the writing is Personal, Transpersonal or Universal. Thus the Prism of Consciousness tool enhances writers’ ability to enhance their awareness of the sources and the final product of their inspiration and allows transpersonal to be identified and manifest in the written word. 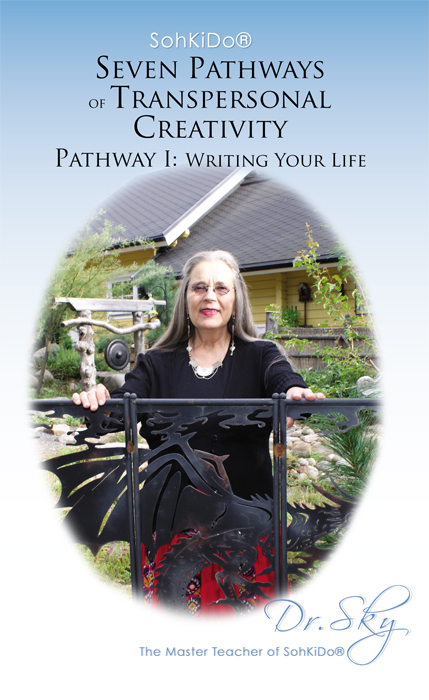 In addition to a personal account of her spiritual journey particularly inspired by Individuals with Differing Abilities and her discovery of the essence of transpersonal creativity, Dr. Sky discusses writing as therapy, chapters thus filled with numerous examples of her own writing. She delves deeply into haiku created for Haiku Meditation Therapy, haibun (travel diary), autobiographical and sacred poetry, stories and plays, and descriptions of the transpersonal processes involved in their writing. The five-book series will consist of: Creative writing, the visual arts, masks and rituals, dance and chanting, and Therapeutic Noh Theater®.